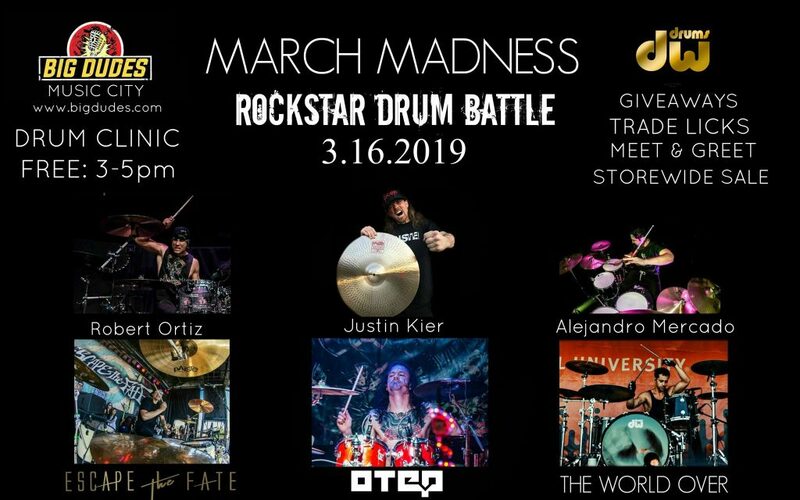 Robert Ortiz / Escape The Fate, Justin Kier / Otep & Alejandro Mercado / The World Over will each perform a few songs, go through their setup and then battle it out. Trading licks with other drummers has become a lost art and way for drummers to expand their playability. This is your chance to play with real Rockstars and make some amazing memories. The goal is to inspire musicians of all ages and skill levels to believe in themselves, realize what they are capable of and to think outside of the box. We will have a ton of Giveaways, Meet & Greet and our Largest Storewide Drum Sale Ever. Make all your Drumming Dreams come true on Saturday March 16th from 3-5pm for FREE. Come watch 3 of the top upcoming drummers in the industry shred it out and start saving like a legend only a Big Dudes Music City!